In the fast paced life of a city like Gurgaon, we need to prioritize and this may lead to missing out on things. Commuting from the office, getting the kids the best amenities, from taking them to school, bringing them back, taking them to extracurricular activities, etc., doesn’t leave time or energy for much. In this scenario how should one move ahead with different things? Everybody wants their child to excel in their studies or at the very least the child should be clear in their concepts. The present generation has seen the fate of those who miss out on these and the struggles they have to go through. This makes a solid reason for them to spare no expense when it comes to their child education. When it comes to this, it becomes necessary to find trusted sources to guide you about the study material or the pedagogy followed. To this effect, PlanetSpark comes to rescue. This platform helps the parents connect to certified qualified individuals passionate about teaching. The platform helps find trusted partners who will intimate the parents about their children about their progress in subjects such as English and maths. 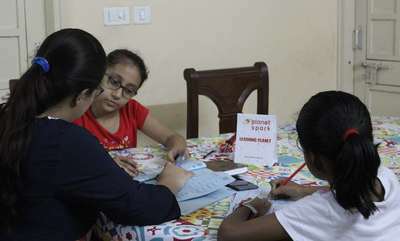 This has helped increase the PlanetSpark’s awareness among parents and they avail its services. Now that the demand has been gauged and likely to increase it became necessary to find mompreneurs. Through a dedicated team, we were able to create a team of homemakers who were enthusiastic about teaching but have little teaching experience. The Homemakers who now wanted to seek their own identity beyond the four walls of her home, beyond the label of wife, mother, daughter in law, came into the folds of Planet spark which provided them the avenue to spread their wings. These homemakers started their own small center(learning planet) where the necessary materials were provided and she was trained. Her entrepreneurial venture was supported by PlanetSpark through online and offline marketing, operating support, etc., enabling her to form a small, thriving center which helped both the students and her. With the rising confidence of the students, her confidence grew. The part in her which she had neglected all these years rose to fore and empowered her. Now she felt a purpose and a sense of being. As her center's children performed well, her reputation as the teacher got established. This encouraged her other housewives friends to pursue this avenue. They became partners with PlanetSpark and thus, they themselves became a mompreneur. This is a simplified version of how PlanetSparks’s popularity grew and how it became the most sought after destination for teacher’s job. Calling it a job per say would be a misnomer as in the literal sense the woman becomes an entrepreneur that is, she is not an employee but fashions her own case, manages her own time, teaches, maintains her personal life so that her work does not hamper her other priorities. She is the master of her own center. PlanetSpark just enables her to do this and more. It helps her to focus her energy on the things she is passionate about while taking into its fold the other less interesting aspects. It provides her with IT enabled support infrastructure, scientific and structured study material, payment gateways, marketing both online and offline, connecting with parents who are need of maths and English tutors within 500 meters of her home. And the best part is that all this can be done from her home itself. These enabling factors are much more flexible than the formal out of schools rigid coaching and learning planets which at times more like another classroom. The model actually facilitates learning key concepts rather than rote learning. The focus on the students is more which is beneficial for both the student as well as the mompreneur as more attention can be paid to the student and the teacher takes pride in the fact that her efforts are much appreciated and is actually making a difference. After all, this is not just a business but value creation at its best. It is the mix of all these attributes that endears these housewives to get associated with PlanetSpark’s mission, vision and value system. And has made PlanetSpark the most sought after destination for teaching jobs seekers. If you want to join PlanetSpark as Teacher-Partner, apply now on www.planetspark.in/teacher.